Unless you're living under a rock then you probably haven't heard of Facebook, or maybe you are still wondering what a tweet is, or how can a mobile application do wonders for your photos with those filters on Instagram. Like it or not, this is the world we live in right now -- where social media and digital media becomes an alternative to the traditional media: TV, radio and print. In a 2011 report published by 24/7 Wall St. for example, the Philippines ranked first in "The Ten Nations Where Facebook Rules the Internet." For this edition of MNP Q&A, we decided to talk to the social media and multimedia team of GMA News and Public Affairs, the team that took over the vacated spot left by Josh Villanueva, now with Rappler. Pia Faustino, who is the multimedia manager of GMA Public Affairs and Ederic Eder, the social media manager for GMA News was kind enough to grant us an exclusive interview, wherein we talked about the rise of social media among the TV networks, GMA News' ranking on Twitter, and how they incorporate these tools during and after the wrath of super typhoon Yolanda, and much more. Pia Faustino: My colleague Ederic's team, the News Social Media Team, focuses on the using social media for our news department, while my team focuses on social media marketing and web content production for the 30+ Public Affairs programs of GMA Network and GMA News TV. Our people are young, creative, and believe in using social media to make news and information delivery more interactive and collaborative. 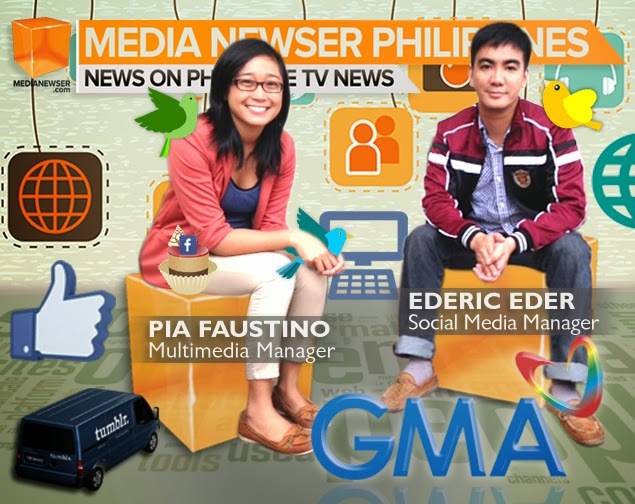 Ederic Eder: The News Social Media team pushes news content on our social media channels including GMA News's official Twitter and Facebook accounts. We also use social media as a newsgathering tool. Members of the Social Media team also run YouScoop, GMA News' citizen journalism arm. We receive, verify, and process submission from our volunteers called YouScoopers. Photos and videos from our YouScoopers become part of our news stories. YouScoop is here to augment our news gathering process and to allow us to also get the news from the perspective of our viewers. We also use YouScoop's social media accounts to gather netizens' opinions on the hottest issues. Do you think the networks should have a strong social media presence in order to be relevant? Why do you think it's important? PF: Yes, definitely. TV viewing habits are transferring online. People are not only using social media and the internet on their tablets and smartphones while they watch TV, they're also using the internet to get a lot of their TV content. Not to mention, citizen journalists everywhere are now participating in the news generation process. It's just a matter of future-proofing our profession and staying current. EE: Yes. We have to be where our audience are. And they are going online -- mostly on social media. Having official and active presence in social media extends the reach of our "Serbisyong Totoo." Along with our official website, our social media presence gives our viewers accessible and reliable source of information from and about us. Actually, responding to their comments and messages shows that we actually care -- that they are indeed our bosses. @GMANews is still the most followed local TV news organization on Twitter. What are your mantras in getting more followers? EE: While we monitor our numbers, we are more concerned with the content that we push. It is also important to maintain the trust of our followers. I believe we retain our leadership by extending on social media the kind of fair and trustworthy reporting that we do on television. Among the local journos, ABS-CBN's Karen Davila remains dominant on Twitter with the most number of followers. Do you have control over the Twitter accounts of GNPA anchors/reporters? How will you able to improve their presence online? EE: We don't have control over our news personalities' Twitter accounts, but we help them promote their accounts by regularly mentioning them on our newscast live tweets and giving them credits for the tweet reports and photos that they post. We also convince and help Twitter newbies get started on the microblogging site. Our latest recruit is @cedric_castillo. In an effort to boost our TV personalities' social media presence, we launched the #FollowKapuso campaign, which features one reporter each week. We post facts and tidbits about the featured reporter and ask our followers to guess who is the subject of those tweets. After revealing who the featured reporter is, we post a video of him or her asking tweeps to follow them. You've recently launched an online tool called Yolanda People Finder to help find and locate our missing kababayans in the Visayas. So far, how's the reception? PF: The person finder was developed by Google. We embedded it on our website and invited our audiences to use it. A number of other media organizations did the same. And rightly so, because the tool is more valuable if it has data coming from a lot of different sources. Since GMA News was being swamped with thousands of missing persons inquiries, we organized a pool of online volunteers to help us encode these names into the database. We also encoded names of survivors collected by our field personnel and other sources like the DSWD. In some cases, our volunteers found matches between missing persons and recorded survivors -- in such cases, we informed the families. In times of calamities, do you think social media is a very useful tool for preparedness and even response? PF: Definitely! Social media can be a great tool for disaster preparedness and response. Social media can be used to disseminate important information about where and when a disaster can strike, and how people can best prepare. During or after a disaster, social media can also be a huge source of fast, big data. It can be used to pinpoint areas and people who need rescue or relief, to map out the damage done, to mobilize volunteers. However, it's not a perfect tool. As we saw during Yolanda, when communications and power were wiped out in affected areas, there was a virtual information blackout. Nobody could call or text the outside world, let alone tweet or post to Facebook. And even if you did happen to have a smartphone with signal, you'd probably be more concerned with finding food, water, or your missing loved ones, rather than updating on social media. So we can't overly dependent on social media during disasters. There is still nothing that can fully replace on-the-ground, first-hand reporting. Ederic, you have a background in news and research. How do you incorporate that to GMA News' social media efforts or campaigns? EE: I started using social networking sites as an online research tool almost a decade ago, when Friendster was still the leader -- and social media wasn't yet a buzzword. Among social media's many uses in news gathering include checking people's backgrounds and relationships, finding case studies, and gathering user-generated content. Social media helped me do my work as a news researcher then. In turn, my background in news research now helps me strengthen our social media content. Hiring managers are now utilizing Twitter and Facebook to recruit people. Do you also rely on social media to hire people? Why and why not? PF: Yes, we post our job openings on the GMA News Facebook and Twitter. It's one of the best, fastest ways of reaching exactly the kind of people you want to hire -- people interested in news, interested in social media, and people who actually follow us. EE: Aside from posting our job openings on Twitter, I also use social media to help me see if an applicant is a good fit for the job. Why do you think GMA News have a strong following online? PF: We have the advantage of being around for many years, and our TV operations give us a huge reach. But basically it's about doing a good job in delivering accurate, fast, balanced information to the public so that you maintain credibility. EE: I believe it's mostly because people trust GMA News. During the election coverage, netizens praised GMA News for its innovations like E13 Hangout and social media hub. Whose idea was that? PF: The idea was a shared one. We wanted to do something new, and since we're a TV company, we figured why not bring a little bit of TV to our online audience using Google Hangout to conduct more casual online discussions of the issues. It was an experiment. We'd like to do it again. You do occasional live tweeting with GMA anchors and we'd like to give your team a high mark on that. What are you planning to do next? Seriously, which of the rival networks do you consider your biggest competition and why? PF: In the media business nowadays, the definition of competition is changing. As a TV company in the internet age, we realize we're not just competing against other TV networks anymore. There's blogs, international news organizations, YouTube, Facebook, Twitter, Netflix, and all sorts of unconventional content producers available to every Filipino with an internet connection. Audiences have more choices than ever before. In a way, who your competition is depends on who your audience is. EE: I believe the GMA-ABS-CBN rivalry on television extends to social media. Do you think social media is the wave of the future? PF: It's the wave of the present. EE: Social media will definitely be a major part of mass media in the Philippines in the very near future. While only around 35% of the Philippine population is online, internet analytics company comScore says the internet audience in our country is the fastest growing in Southeast Asia. Also, 96.1 percent of Internet users in the Philippines visit a social networking site. It is the highest in the region. What's your advice to people who are considering a career in social media? PF: Social media is just a tool, and tools change. Aspire to build a career delivering news and information that's relevant and useful and interesting to people. If you truly want to do that, then you have to embrace whatever tools are best for achieving that. Being a good media practitioner means embracing new tools and experimenting with them to achieve your desired result. EE: Those who are interested in social media need to make sure what kind of social media work they are interested in. Do they want use it to promote products and services? Do they want to create content? As for my team, I describe them as "journalists using social media" instead of "social media practitioners."